If a level could wear a tuxedo, it would look like this. All right, this one isn’t really a question, but if you would be so kind, please list the levels you’ve published on PSP to date and any statistics you’d like to share with us, i.e. plays, hearts, how many rocket animals per level, etc. Whatever you feel like sharing. Fort Sugar III is one I am very fond of. I started to stretch my legs in create mode after fooling around for a month or so, and I was very pleased with the overall level designs and gameplay. Looking at it now it seems very simple, but it is still fun. But the Fort Sugar Christmas Special is my favorite. Out of all my levels it is the only one with a real story (thanks to Fastbro), and I had three months to work on it and perfect it is much as I could. I have always loved platformers, and the first time I saw it at E3 I was hooked. I had to have it. I never got into creating on PS3, but I was determined to make levels when it came out on PSP. In-A-Gadda-Da-Vida on my old PSN (odomodometer). And it was awful. It is still on the servers though, if you want a good laugh and to see how far someone can come creatively in under a year, give it a play. jackofcourse was my first hero in LBP. Even on PS3 he was my favorite creator. Flaming Timberland was my inspiration for the original Timber Canyon. Well first of all, I am not an artist. I can not draw, paint, or make anything. I am however, a bit of a musician. I have played guitar since I was eight, played in a few bands. One almost got signed by a known label, but it in the end it just didn't happen. I still play and write music though. To me writing music and creating in LBP are very similar. Making something from nothing. I like to listen to old songs I recorded a few years ago, and it makes me proud to know I created something like that. When I play my levels in LBP I get that same sense of pride. LBP makes me happy and keeps me out of trouble. It's a win + win. I love platformers so I have to give props to Mario. Mario 3 is my favorite platformer of all time, besides LBP of course. I love RPG's. Mass Effect 1 and 2 were incredible. The Elder Scrolls - Morrowind and Oblivion, Fallout 3. Shooters are a lot of fun. I have put some time and money into the Call of Duty and Halo franchises. Bioshock 1 was insane, and I can't wait until Bioshock Infinite. If you could list your favorite things about LittleBigPlanet PSP, what would they be? It gives you the opportunity to create pretty much anything you can dream up. Spam levels, corrupted data, and the Turbo material glitch. Not in any particular order. I had another version of Sugar Roots that was finished. I had built that level for the Ultimate Platformer contest. About a week before the deadline my profile corrupted, and when I went to my file backups, the only other version was the beginning. I ended up making a rushed level for the contest over the next week, and I didn't win a sticker. I remember everyone seemed shocked that I didn't win a sticker. I wasn't. And it's kind of ironic but Cambridge ended up featuring Sugar Roots a couple weeks after the contest. Weird. There are a few ideas that had to scrapped due to an unruly wobble bolt, but that's about it. Wow, that's a big jump. I don't think I... Oh look, score bubbles! You are considered to be one of the best platforming creators on PSP, but everyone has to start somewhere, and you started with your first three Fort Sugar levels. One thing that really stood out in those levels were the hidden catapults that propel the player around the level at different times. This mechanic became sort of a trademark for your levels. What inspired you to make this mechanic? I honestly don't remember where I got the idea. Playing the story mode in LBP1 there are a few catapults and I thought it was fun. I had tried to make them before using a different process, mainly having the sensor switch set to one shot, and the piston to flipper motion out. But I didn't like the way it had to reset, like it wasn't quick enough. Then I set the switch to direction and inverted, and the piston to direction and backwards and it worked perfect. Tweaking it to get them perfect takes time. I think I have used them in every level I have made on my VJ account. 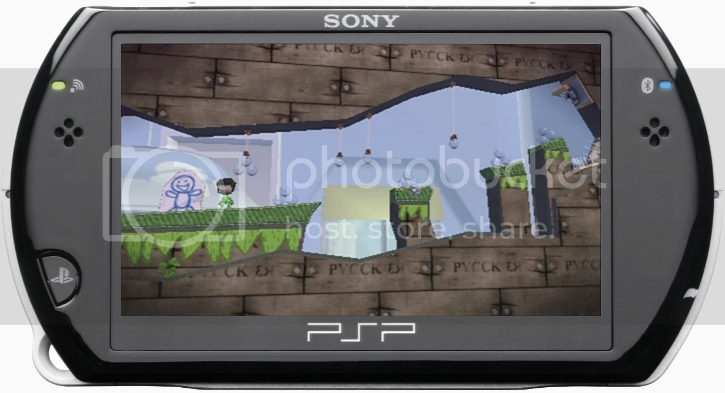 When LBP2 was announced with the new bounce pads, I thought to myself, I have been making those for a year on the PSP. Hahahaha!! There wasn't much of a story, if any, in your first handful of levels, but then out of nowhere you threw Isla Moya at us and really impressed a lot of people with the fact that you were not only a master of platforming, but could also weave a great tale. What led you to try to include story in your level and did you enjoy mixing platforming with story telling? Kaiju Kid's Lifespan inspired me to do a story. Not that I could come close to the wonderful tale he told in that awesome level, but we started talking and he said I should do a story. He is great at inspiring me to think differently when creating, and I valued the advice and inspiration he gave me. I felt like I was getting in a rut creatively around the time I released Sugar Roots. With Isla Moya, I tried to create differently. I tried a bit of story telling and I tried using stickers. The intro of that level was really the only story part, after that it turns into another platformer, but I was happy for doing it that way, and I am proud of it. Jimmy's Room was another attempt at a story but it was easy for me because the dialogue was from a two year old boy. Um... I think I just insulted myself. You seemed to pretty much have layering figured out when you began creating. Even the original Fort Sugar had a great sense of depth due to the layering you did. Are you just a natural when it comes to layering or did certain levels really stick out to you and you drew inspiration from them? The levels from the Bazaar in story mode had great layering with materials and that stuck out to me. With Fort Sugar, I started doing that. I remember thinking how much more detailed everything looked after doing that. That is one of my favorite things to do in create mode, the layering of materials, and trying to figure out which ones look great together. Some people tend to get all hot and bothered when there isn't a story in a level, and others get upset when there is a lot of story. Do you lean either way and do you aim for your levels to be light on story to cater to those who don't want story? Or, do you just enjoy making pure platforming most of the time? To be completely honest, the story has to be good to get me interested. Most of the stories I come across in LBP don't hook me. I am a gamer first and foremost, so if you are going to pull me away from my platforming or interrupt my bubble chain with a magic mouth it needs to be good to keep me interested. There are some great writers in LBP PSP though. Poo and Taffey are both amazing story tellers. I love how Poo uses the limited toolset on PSP to weave these incredible epic tales, and Taffey is the most funny guy ever. Fastbro impressed me early on with his flowing dialogue and believable characters. But, when I start making a level, I have one thing on my mind. Gameplay. To me that is what makes LBP. 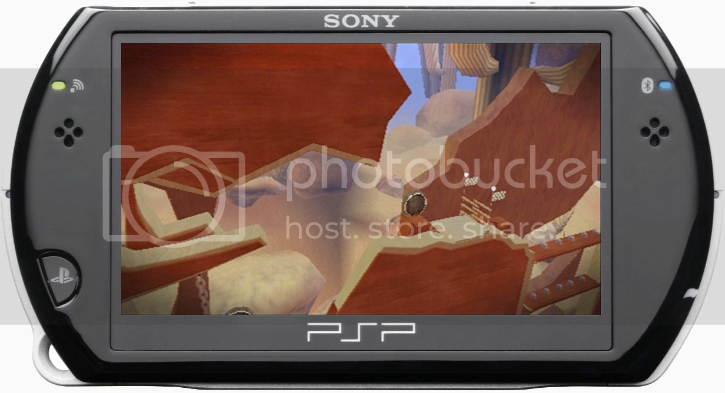 When you started building for PSP it seems that you stuck to a specific art style with the Fort Sugar levels. Those levels looked very similar and used nearly the same mechanics (which is not a bad thing when the mechanics were so good!). Was it hard to start breaking out of that Fort Sugar shell and start making Timber Canyon and future levels that had a different art style and used new mechanics? After Sugar III, I really wanted to try something different. Plus I had just bought the Savannah DLC and that cocoa wood looked amazing to me, so I started building with that. TC was the first level I used any logic in too. None of the first 3 Sugars used any logic. TC took a long time to build. The first version got corrupt and I started over, but on the second build I hit a nice groove, and I started to try different mechanics. The wooden wave was something new, I had never seen that on PSP, so I was proud of that. Plus I started to get a feel for where I should place my score bubbles, and the first time I had hidden areas. The art style came easy for me since I only used four different materials and no stickers. That level got nominated for a Sacky for best artistic achievement. I couldn't believe that. Your style of level is so fun that a few authors have copied it to the point where it feels almost exactly like I am playing a VelcoJonze level. How do you feel about this? Flattered. I think that is the ultimate praise someone can give. BlueBulletBill openly admitted that he went with my style, but he improved on it in my opinion, and I thought that was really cool. So yeah, I think it's awesome that someone would like my style enough to do that. Spark said that he was inspired by me when he made Article 5. That made me happy for weeks. A month later I was inspired by him and Jumpbutton and made Isla Moya. Which of your levels was the most difficult for you to build? Over the Hills and Far Away, no doubt. That level took two months to build. I hit a roadblock creatively half way through, and struggled for a week or so. I finished it, almost published it, then decided to delete over half of it. SketchNZ and I talked one day, and I showed him the new version. He really helped me that day. I ended up finishing it a week later, much better. I really love to play that level, I think it's my best looking one, I just try not to think about what I went through building it when I am playing it. We have seen sequels from you with your Fort Sugar series and Timber Canyon series. Can we expect to see any of your other levels to spawn a sequel? I have finished part two of Isla Moya. It begins on that dark island, then you end up on another island before finally making it to the mainland, which is where Over the Hills and Far Away starts. The only problem is, when I say I am finished, I mean the thermo is maxed out, I have terrible lag, and I still need to build the mainland. I have temporarily put that one on the shelf and who knows if it will ever get published. I started on Tera Cota II, but building in only cardboard seems boring to me now, so I might not finish that. I will make Timber Canyon III. That is a guarantee. If you could go back and change one thing about any of your levels without losing your hearts and plays, which level would you change? I would probably change the ending of Isla Moya. Putting a brain on the scoreboard and ending it that way is something I did on the last day, and I was happy with it at first, but when I play it now, it just seems weird. That is something that has bugged me for a while now. If I was Jimmy, I would want to be sent to my room all the time. Fresh out of budget to record a new Spotlight video, Taffey and poo meet up to discuss their ideas... or rather the fact that they don't have any. If we've learned one thing from VelcroJonze, it's that good gameplay is difficult to create but easy to recognize. And if we've learned 6,790 things from VelcroJonze, it's that score bubbles are even easier to recognize and highly addictive to try and chain together. I'd write more but I'm pretty busy going for the top score on Tera Cota right now. Just go play all of his stuff - you owe it to yourself. And watch out for the hidden... oh never mind. Well, that's all, folks! We hope you have enjoyed this installment of the Creator Spotlight. For past spotlights, please visit this link. See you in two weeks! Well done Velcro my freind! Well done to the spotlight team as well! Wow, you deserved this for sure VelcroJonze! You're levels are always amazing. They were interesting to see in create mode. As for Taffey and Amazingflyingpoo, good job on the interview! I can't tell you how happy I am that we were able to feature one of my very favorite creators of all time. Congrats VJ! Great creator spotlight! Congrats VJ! Wow, thanks so much for this huge honor. I am really in shock. Even though I knew this was going to happen, I still find this hard to believe. There so many great creators in lbp, and to be considered for this is unbelievable. My levels are pretty simple compared to what has been spotlighted previously, so this is very cool. Thanks so much to Taffey and Poo for your hard work and the words that are so kind. Thanks to Jeffcu28 for inviting me here to this wonderful site. And thanks to the rest of the spotlight team, for the work you do on these awesome creator spotlights. Grats man, well deserved! Your levels are always a blast and a big inspiration! And thanks to the crew for the awesome interview and video! =D Awesome read and video! Congrats VJ you totally deserve this spotlight. Well done Velcro! I haven't tried your levels but as soon as I get on the PSP I might. Congrats Velcro, you really deserve this! Your levels are gold dust! You definitely deserve it! I love your levels and its gameplay! Your levels are in recommended levels list on Russian LBP community site - http://littlebigrussia.ru/index.php/...oollevels.html (sorry, there are not all your levels, because we totally have no time to re-new this section but soon we will do it!). And it was very cool to watch your level's mechanics with Poo and Taffey commentaries. See you and may inspiration be with you! Finally! Ive been waiting months for the King to be crowned!! Great job Poo and Taffey!! Great interview, great answers - really had fun reading it thanks for bringing us another fantastic creator spotlight!! It's wonderful that the PSP community is so close and support each other so much. Congrats, VelcroJonze! Job well done, crew! Congrats VJ! It was a blast putting this spotlight together for you since your levels are so much fun! Taffey, that is the best pod design I've ever seen. Woo! VJ got spotlit! Congrats, man! You are Incredible!